But when churches were built over the bodies or ashes of saints and martyrs, or their remains were translated to the churches, a strong desire began to be felt that the dead should receive the protection and benefit of such sacred neighbourhoods. Therefore, first the clergy, then kings and persons of rank, and last the common people, were interred at first round about the church, then in open places attached to the outward wall, which were called 'Galilees', and at last within the church itself. The facility which the proximity of the graves to the churches afforded the clergy in performing the customary rights for the dead, not a little contributed to the introduction and continuance of the custom. It is said to have been introduced to this country from Rome about the middle of the eighth century, by Cuthbert, archbishop of Canterbury, so far as churchyard cemeteries are concerned. Lanfranc, also archbishop of Canterbury, is stated to have been the first who brought in the practce of vaults in chancels, and under the very altars, when he had rebuilt the church of Canterbury, about the year 1075. 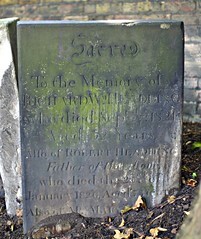 But there is no doubt that graves in churches, for the clergy at least, existed at a much earlier period in this country; witness the story of the reappearance of St. Dunstan, to complain at the annoyance he underwent from the interment of the son of Earl Harold in the same church with him. However, from Lanfranc, the practice seems to have prevailed in London without interruption until the Great Fire in 1666, which effected a very great destruction of the churches, and, together with them, of the contents of the vaults and churchyards attached to them. The evil of the practice had become apparent before that event, and considerate people lamented that advantage was not taken of the calamity to introduce a better system. 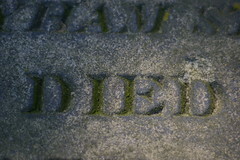 "I cannot but deplore," says Evelyn in his 'Sylva', "that when that spacious area was so long a rasa tabula, the church-yards had not been banished to the north walls of the city, where a grated inclosure, of competent breadth for a mile in length, might have served for a universal cemetery to all the parishes, distinguished by the like separations, and with ample walks of trees, the walks adorned with monuments, inscriptions and titles, apt for contemplation and memory of the defunct." That this, or something like this, was not then done cannot seem very surprising, when we perceive that, at this more enlightened day, people exhibit no great alacrity in availing themselves of advantages somewhat resembling those which the excellent Evelyn wished to afford. With some of the metropolitan churches, there are regular graves under the aisles and pews, the same as in church-yards; in others, "pits" or vaults (not bricked, but of earth) the entrance into which is within the building. In others, the vents of the vaults are actually within the church. Thus in various ways, pestilential effluvia are sent through the building. A candle will not always burn in the vaults beneath, and it is sometimes necesssary to leave the entrance to them open for several hours before it is safe to enter. 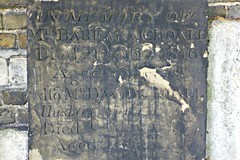 Mr. Carden, in his petition to parliament on the subject of a general cemetery, speaks of one church in which he understood that the use of fires had been abandoned, owing to the increased effluvium which was found to arise from the vaults under the church; and in another part of the petition, the same gentleman, who has given much attention to this subject, states that, in the year 1825, he entered the vaults of St. Dunstan's church in Fleet Street, and found that the dead were there deposited in coffins of wood only, and saw the coffins below crushed by others placed upon them, and the remains of a recently-interred corpse forced in part out of the coffin, and in a state of decomposition too disgusting to be described. Even if this were a singular incident, still a system under which such accidents could occur ought not to be maintained. 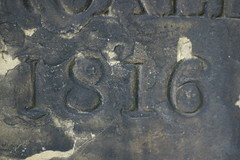 The invariable use of lead coffins might, in some measure, prevent such effects as we have stated; but it has been ascertained that in the vaults of a city church, where lead coffins were always required, the air had become so vitiated, that lighted candles attempted to be carried in were immediately extinguished. It appears, in fact, that no arrangements can make it cease to be an evil to bring together the bodies of the dead where the living inhabit and congregate. Under the best arrangements which might, by careful vaulting and excluding all communication with the exterior of the church, keep it tolerably free from the taint, still the surrounding air must be contaminated by the effluvia escaping through the open gratings made to render the vaults in any degree fit for entrance; thus effecting no more than a transfer of the nuisance from the church to the church-yard. But the church-yard itself is a great nuisance, particularly when closely hemmed in by houses on all sides, as is usually the case in London. The burial-grounds are of such limited extent, and have been so long in use, that instances are related in which a lighted candle will not burn when placed in a newly-opened grave, or even upon the thrown-up soil. "In large towns," says the 'Quarterly Review', "and especially in the metropolis, it has become more difficult to find room for the dead than for the living. 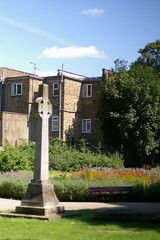 The Commissioners for the Improvements in Westminster reported to parliament, in 1814, that St. Margaret's church-yard could not, consistently with the health of the neighbourhood, be used much longer as a burying-ground, for that it was with the greatest difficulty that a vacant place could at any time be found for strangers: the family-graves would generally not admit of more than one interment, and many of them were too full for the reception of any member of the family to which they belonged. There are many church-yards in which the soil has been raised by several feet above the level of the adjoining street by the continual accumulation of mortal matter; and there are others in which the ground is actually probed with a borer before a grave is opened! Many tons of human bones are sent each year from London to the north, where they are crushed in mills contrived for the purpose, and used as manure. 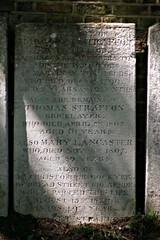 Yet with all this clearance, the number of the dead increases in such frightful disproportion to the space which we allot for them, that the question has been started whether a sexton may not refuse to admit iron coffins into a burying-place, because by this means the deceased take a fee simple in the ground which was only granted for a term of years? A curious expedient has been found at Shields and Sunderland. The ships, which return to these ports in ballast, were at a loss where to discharge it, and had of late years been compelled to pay for the use of the ground on which they threw it out. The burial grounds were full: it was recollected that the ballast would be useful there, and accordingly it has been laid upon one layer of dead to such a depth that graves for a second tier are now dug in the new soil." When, for the sake of gaining room, a greater depth is required, it frequently happens that a passage is opened through ground already tenanted. 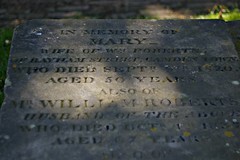 These facts certainly warrant the conclusion that the vaults and graves are insufficient for the increased and increasing population of the metropolis; and from this insufficiency circumstances arise that are revolting, whether considered with regard to public health, or to that decency and respect with which surviving friends very properly desire that the remains of the dead should be treated. Public attention has, of late years, been in various ways drawn to this important subject, and we doubt not that every thing has been done for the best which the continuance of the evil itself allowed. But the only effectual remedy is the complete discontinuance of the existing practice. We are happy to find that interments in vaults under churches begins to be discouraged, and in some circumstances are not allowed. And we understand that the commissioners for building the new churches could rarely obtain sites for the purpose, until they abandoned the intention of having cemeteries in connexion with such churches. 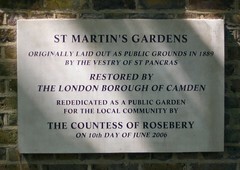 This very proper determination was very general among the owners of land in London; and it is in consequence of this that few of these churches have ground attached to them; and, where there is open space, the parishes are strictly bound not to use it for purpose of burial: nevertheless it appears from a recent return made to parliament, that several of the new churches which have no church-yards, have vaults underneath the building. After these statements, we should very much regret to have to say that nothing had been done towards the introduction of a better system. But something has already been effected, and more has been planned. We shall, in the present paper, confine our attention to the measure which has been brought in to operation under the direction of the General Cemetery Company. 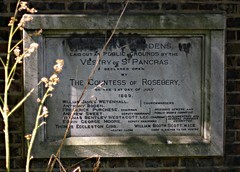 The cemetery established by this body must now, and in future time, be regarded with peculiar interest, as the first practical attempt to remedy a great public inconvenience. 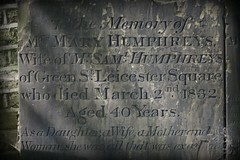 The metropolis, however, will not be entitled to claim the merit of having first introduced this important public improvement of detached public cemeteries into this country; since such cemeteries had been previously established at Liverpool, Manchester and in other places. 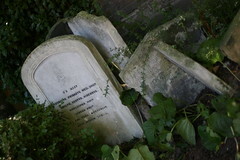 We believe that the public attention was first, in our own time, strongly drawn to the necessity of established detached cemeteries for the metropolis, by Mr. G. F. Carden; and after long-continued exertions by that gentleman, dating as far back as 1824 or 1825, an Act was passed, in 1832, "for establishing a general cemetery for the interment of the dead in the vicinity of the metropolis." 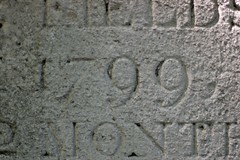 This Act invests the Association with the usual privleges of an incorporated body, and authorizes it to do what it has since in a great measure accomplished, and which we shall now describe with rather more brevity than would otherwise have been desirable, had we not recently described the cemetery of Père la Chaise, which afforded the model which seems to have been as closely as possible followed in the Kensall-Green Cemetery. Previous to the passing of the Act of Incorporation a very eligible piece of land had been provided, consisting of forty-eight acres, and situated on a rising ground to the north-west of the metropolis, about a mile and a half beyond Paddington, on the Harrow Road. From this spot, which extends between the road and the Paddington canal for about a quarter of a mile, a very delightful view, bounded by the Surrey hills, is commanded over the western environs of the metropolis. That this view may not be excluded, the high wall which incloses the cemetery is in some parts broken by an iron railing of equal height. The ground, thus inclosed, is laid out in gravel roads of sufficient width for carriages, and planted with forest trees, evergreens, and other shrubs and flowers. An arched gateway is placed towards the eastern extremity of the cemetery, and conducts into the unconsecrated ground, which has been appointed to the interment of persons whose friends desire a funeral ceremony different from that of the Church of England. This spot consists at present of about four acres. Only three interments have as yet taken place there; but the finest building that the cemetery at present affords has been erected on it. This is the Chapel for the performance of burial rites. It occupies the centre of a colonnade, and the front presents a pediment supported by four columns of the Ionic order. Its interior arrangements are neat, but perfectly simple, and well adapted to the purpose for which it is intended. The unconsecrated ground in the Kensall-Green Cemetery is separated from the consecrated by a sunk fence. Looking westward from this line of separation over the consecrated ground, the visitor has before him a long vista of slightly-ascending ground, the termination of which is concealed by trees and shrubs. We have already stated how the spot is laid out. There is not much in the first view to inform a person of the purposes to which the place is devoted. 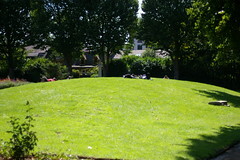 The ground was only opened in the early part of 1833, and since then we are informed that 193 interments have taken place; but many of these are in the subterranean catacombs; and those in the open ground are so dispersed that the monuments are by no means the first objects to attract the eye. We did not give anything like a detailed attention to the graves, but we were most interested by a lowly grave covered in with cut stones, and with myrtles planted around: "To the best of mothers, who reposes here in peace," is the simple inscription, in the French language. 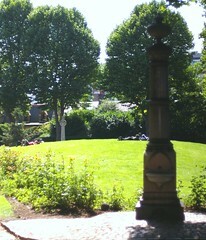 The most conspicuous objects in this part of the cemetery are the chapel and the colonnade. The chapel stands nearly in the centre of the ground, and is intended for the performance of the burial service according to the rites of the Church of England. It is a very appropriate little building, although not so large or so handsome as that in the unconsecrated ground; but we were informed that it is only a temporary structure, a site having been reserved for the erection of another on a more extended scale. Along part of the northern boundary wall, a series of catacombs extends, which are at present calculated to contain about 2000 coffins. The line of these vaults is indicated, above ground, by a colonade of Greek architecture, designed for the reception and preservation of tablets and other monuments in memory of the persons whose bodies are deposited underneath. The coffins intended to be deposited in the catacombs are received upon a sort of platform, which descends slowly during the performance of the funeral ceremony; and they are afterwards conveyed by machinery through the subterranean passage to the places where they are to be laid. 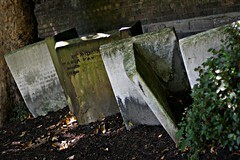 The employment of leaden coffins is indispensible in the catacombs, and in vaults or brick graves in the grounds, but in common graves in the grounds, purchased in perpetuity, the coffins may be of lead or wood at the option of the purchaser. 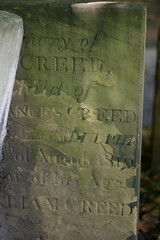 When, however, the perpetual right to a grave is not purchased, the coffin must be of wood only. In the latter case, also, monuments cannot be placed upon the grave; but when the perpetual right is purchased, any monument may be erected without additional charge. The right to a grave purchased in perpetuity is so well defined, that it may be the subject of a bequest by will, or an assignment, in the same manner as other property. 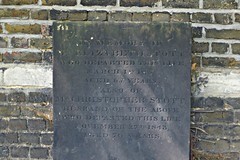 It is important to state this, because in the ordinary church-yards it is impossible to secure a grave in perpetuity at all, unless by the expensive means of a faculty; and consequently the mere placing of a monument upon a grave does not prevent its being afterwards used for persons not members of the family. 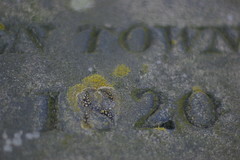 We have thus stated the points which seem of leading interest or importance in this establishment; and although, in the great extent of ground it affords, not more than 193 interments have taken place in a year and a half, while we could indicate a burial-ground of less than two acres in the metropolis in which upwards of 500 bodies were interred in the year 1832*; yet, considering the prejudices that were to be overcome, the encouragement which the new cemetery has received already is greater than we should have expected. We make no question that many years will not elapse before such suburban cemeteries will have completely superseded those which now make the dead divide the largest city of Europe with the dead. But such cemeteries can hardly be brought into full operation until the chief inducement, among the labouring classes, to the interment of the dead in the nearest ground has been removed, by diminishing the expense and labour of conveyance to a more distant place. 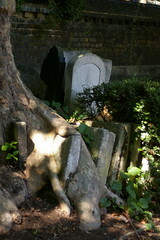 We do not see why the persons connected with the cemetery might not themselves organise a system of conveyance, with a scale of various prices and vehicles, which might afford to all but the extreme poor the means of decently but cheaply conveying their dead to "the house appointed for all living". 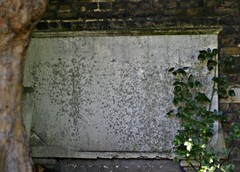 We understand that it is in contemplation to establish another cemetery, also on the plan of Père la Chaise, at Bayswater, about two miles from Oxford Street, on the Uxbridge Road. In describing that which is already established, we have, however, exhausted the space we can afford to give the subject, and the difference between it and the one proposed does not seem so considerable as to require a separate notice. 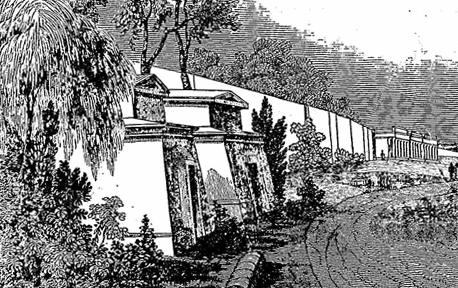 Filed under: 19th Century London Cemeteries Magnificent Seven Kensal Green Cemetery.